Lots of reptiles and amphibians here right now. They need help too, and equal care to birds and mammals. Garter snake with a wound on his side, red eared sliders with shell rot, snapping turtle with a deformed shell from being kept as a pet, eastern box turtle missing a leg, American toad found in the snow, a little too early to be out of hibernation. 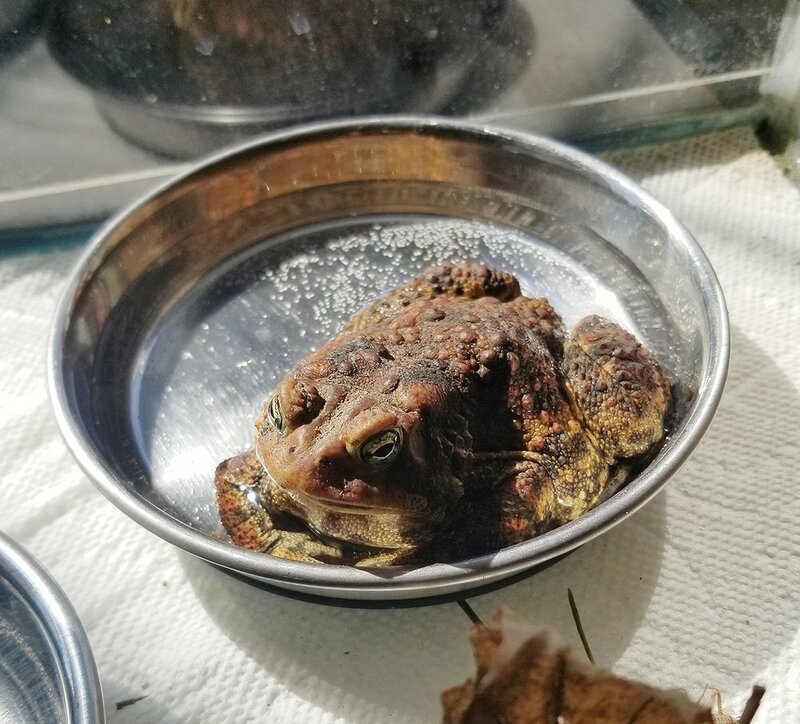 "Toadbert" is really cool and we hope to get him back out real soon. We also have a three-toed box turtle that was also found out in the snow. They're not native box turtles to PA, and are often kept as pets to circumvent the (very wise) laws against keeping native box turtles (because their numbers in the wild are plummeting). But someone probably got tired of him and thought dumping him in the woods was an option. That's not okay---because they're not from around here and can't hibernate properly and will die. Keeping any pet is a lifetime commitment, but we strongly recommend against keeping any kind of wild animal, even legal ones. They aren't interactive and don't want to be with you. They deserve to be free! Adopt a dog or cat instead. An important note about our center: we and many other wildlife centers are not normally able to take non-native turtles except in extreme cases where immediate humane aid might be called for, and no other help is available. As we are a wildlife rehabilitation center, we do not have the resources to deal with pets. There are pet reptile rescues that can help in those situations. In the case of the current exceptions that we wound up with, they will not be released into the wild because that would not be ecologically prudent. Rather, we will find appropriate homes for them. This has to be done very slowly and carefully, so that they do not wind up discarded back into the wild again. This is why we strongly discourage buying these animals as pets. As far as native reptiles, NEVER take them from the wild to keep as pets!